Equipment: satellite TV; internet access Wi-Fi (included); Heating. Feature: Property in a multi-family housing (max. 4 floor(s), 4 units in total). Furnishing: holiday standard, carpet, laminate floor. Please note: Owner lives raised ground floor. apartment, 2 people, 1 room/s, 1 bathroom/s, approx. 27 m², 1 floor/s, apartment on floor 2, south-west-facing location, panoramic view, restored 2014. Kitchen: Kitchen/ cooking equipment: 2 ceramic hobs, microwave oven, dish-washer, refrigerator, coffee machine, water boiler. open to the living room. Living room/bed room: 1 x double bed, exit to balcony. Estate: (shared use): open plot, in a hillside, meadow. Garden maintenance by the owner. Situation: in the village Fendels, suburbian area, hillside location, altitude 1356 m, panoramic view. Wellness: shared use (payment): sauna (available during the whole season). Plot description: 1 x parking on the estate. balcony (partially roofed), furnishing provided (1 garden table, 2 chairs), sunshade. Arrival: Airport Innsbruck in approx. 86 km. Train station Landeck in approx. 17 km. Beach/waters: Lake (bathing possibility) in approx. 6 km (Badesee Ried). Cable car: Fendels-Ried, in approx. 750 m.
Golf course: Golfclub Mieming (27-hole golf course) in approx. 58 km. Next village/town: Center Prutz in approx. 4 km. Innsbruck in approx. 86 km. Landeck in approx. 17 km. Public swimming pool: Indoor public swimming pool in approx. 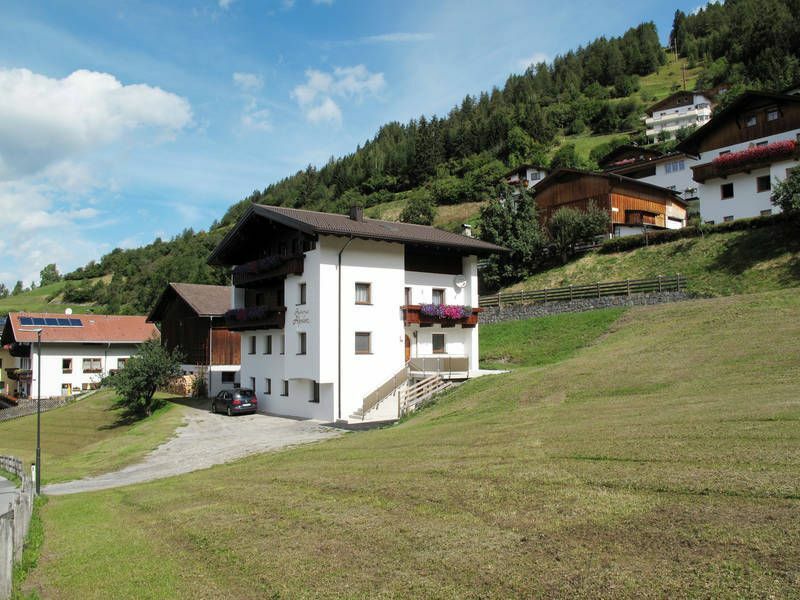 16 km, reduced entrance for INTER CHALET guests (Feichten ). Public outdoor swimming pool in approx. 5 km, free entrance for INTER CHALET guests (Erlebnis-Freibad Prutz: ca. 01.06.-15.09.). Shopping: Next shopping possibility (Fendels) in approx. 500 m. Next supermarket (Prutz) in approx. 4 km. Ski bus stop (from 28 SEP 2019): in approx. 5 km (Prutz - Fiss/Serfaus). Ski run (from 28 SEP 2019): Fendels in approx. 750 m. Fiss/Serfaus in approx. 15 km. Glacier skiing resort in approx. 40 km. Piste in approx. 750 m.
Ski school (from 28 SEP 2019): in approx. 750 m.
Toboggan slide (from 28 SEP 2019): in approx. 750 m.
Hard to fault, clean well appointed with a fantastic view from the balcony. Stayed nice and cool during the recent hot weather! Owner was friendly/welcoming. Worth being aware no oven/grill and the WiFi can be intermittent. Top ausgestattete Ferienwohnung mit Blick auf Berge und Inntal. Moderne und sehr saubere Ferienwohnung. Wanderwege beginnen nahe der Unterkunft. Der Vermieter war sehr wortkarg.